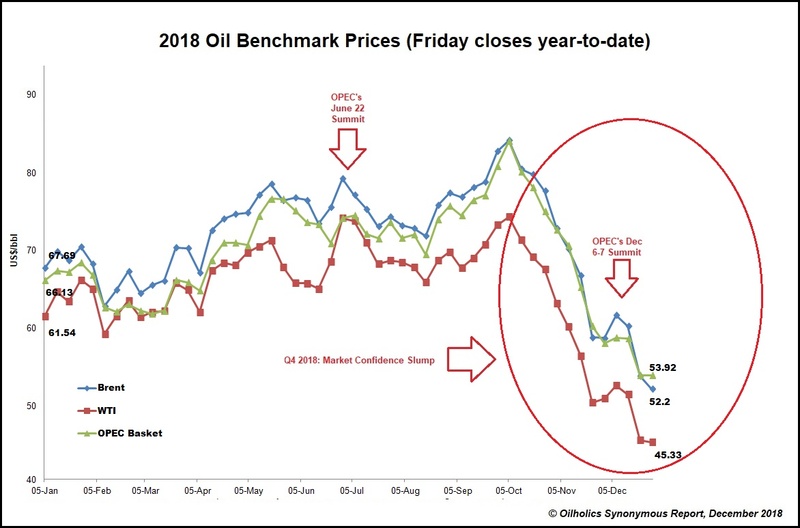 Here's how the 2018 oil market shaped up (click to enlarge chart below), and some thoughts on what OPEC's shale dilemma means for this crude world via Forbes (click here). That's all for 2018 folks, lets see what 2019 brings. Keep reading, keep it 'crude'! 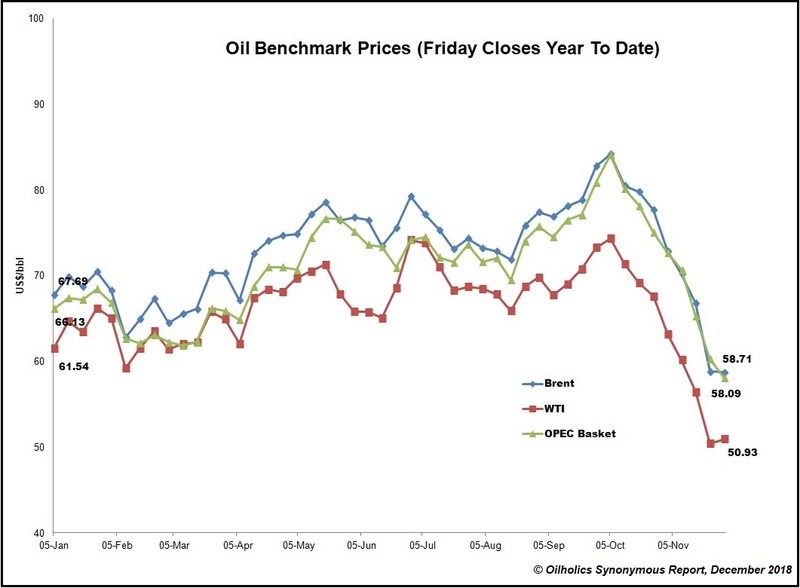 Chart: 2018 Friday closing levels of oil benchmarks © Gaurav Sharma 2018. 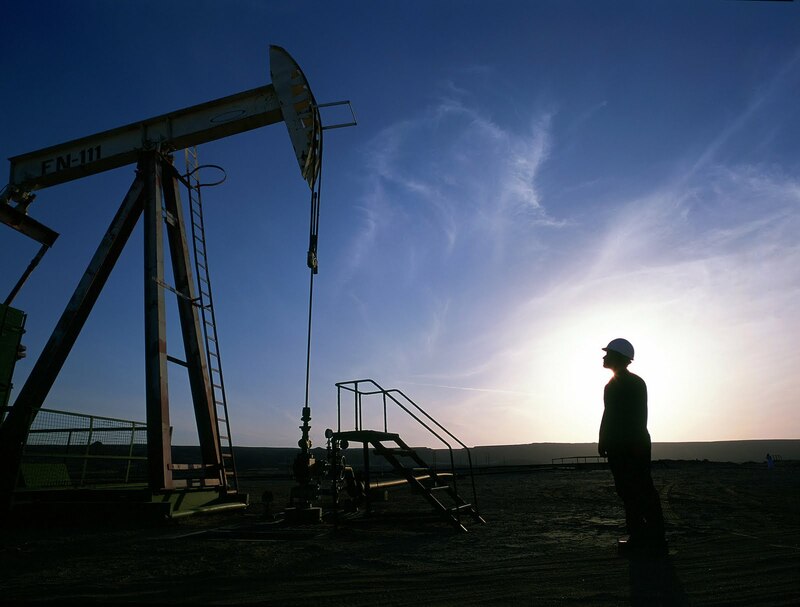 As promised post-OPEC, the Oilholic is putting forward some more composed crude thoughts, following the Non-OPEC and OPEC declaration of a 1.2 million barrels per day (bpd) oil production cut last week. Here they are via a Forbes piece. One's verdict - it won't be enough, even if further Iranian declines increase the cuts to 1.5 million bpd. There's always the issue of compliance and demand side pressures too. 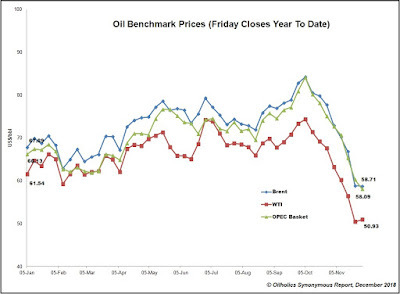 Crude oil benchmarks are not spiking anytime soon. 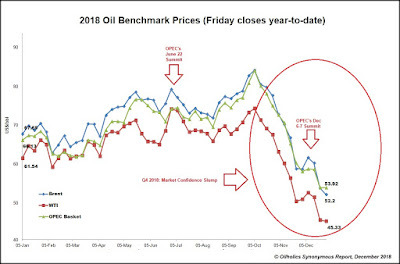 In case you haven't heard dear readers, which the Oilholic doubts or you wouldn't be reading an oil market blog - OPEC has calmed the crude market with a 1.2 million barrels per day cut, in concert with 10 non-OPEC producers led by Russia. Both Brent and WTI are up by over 4% at the time of writing, and Iran is smiling all the way to the bank having secured an "exemption" before US sanctions start biting more meaningfully. Will provide some more composed thoughts upon return to London from Vienna, as one has to scoot to the airport. That's all from Vienna folks! Keep reading, keep it 'crude'! In a rather unprecedented development of sorts, the 175th OPEC Summit's concluding press conference was cancelled, as member nations could not agree to er...a..concluding statement. Sources say Iran, and other members exempt from oil production cuts, were asked to participate in a proposed cut and declined to do so. Hence, the can got kicked down the road, and proceedings will resume on Friday (December 7). 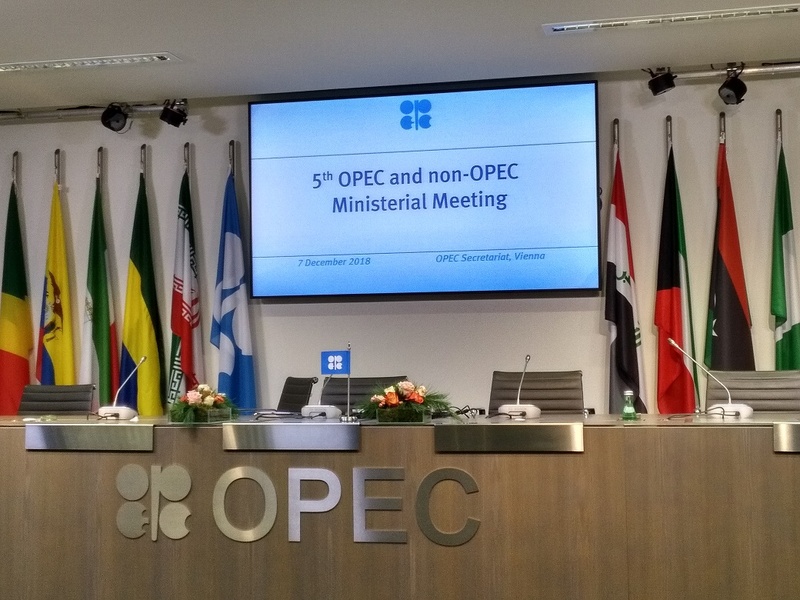 There is expected to be some sort of announcement after discussions with the Russians and 9 other non-OPEC producers. Things do remain on track for a 1 million barrels per day (bpd) cut, but its doubtful that would push the bears that far. 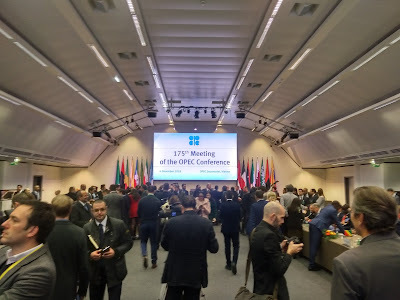 The event is unprecedented in recent times, and only once in the past has OPEC failed to hold a concluding press conference. We've had one even at times of acrimony and differing positions between its members over the years. As for the market, WTI is down 4.86% to $50.32 per barrel, while Brent is at $58.88, down 4.35% following the development. Bit of a farce this is, but that's all from OPEC this evening. Keep reading, keep it 'crude'! © Gaurav Sharma 2018. Photo: Empty podium at the 175th OPEC Meeting Press Conference, Vienna, Austria © Gaurav Sharma 2018. 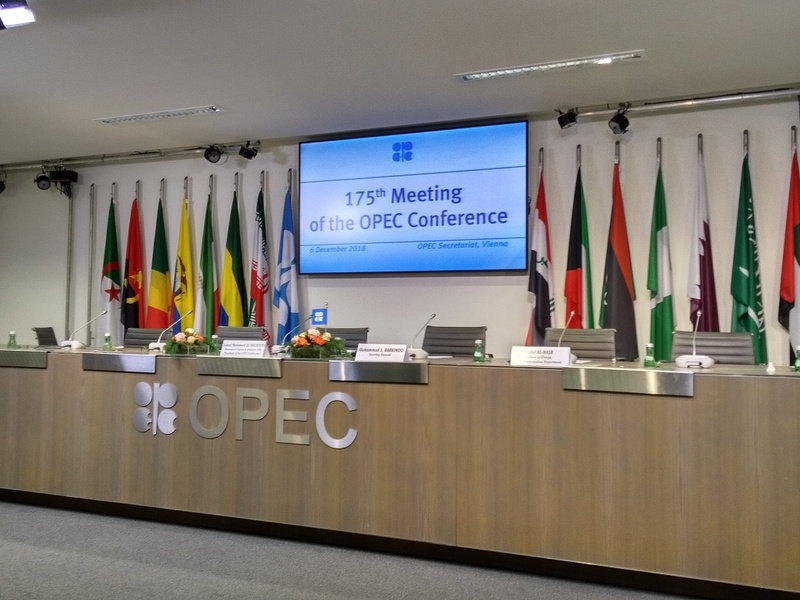 It's the usual manic start to the 175th OPEC Ministers' Meeting here in Vienna, Austria. For those unfamiliar with the drill, here we go - a long queue of analysts and journalists, the Oilholic included, waiting to get in, followed a long queue to go up to see the ministers in the summit's conference room, followed by a mad dash to see them, followed by a media gang b..., I, er media scrum, and the security chucking everyone out! True to form manic wires and tweets follow, and Thursday (6 December) was no different. And here is a link to Al Mazrouei's opening statement to the conference. 1) The Saudis are still denying any discussions were held with the Americans with regard to oil production levels. 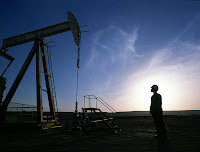 2) Data suggests Riyadh is pumping in excess of 11 million barrels per day (bpd). 3) An OPEC cut of 1 million bpd is likely (which would be below market expectations). 4) All rather mum and diplomatic about Qatar's decision to quit OPEC. 5) Saudi Arabia wants "all" participants to contribute to cut, Iran is against it, while Libya and Nigeria are exempt from it (as things stand). More from Vienna soon! Keep reading, keep it 'crude'! © Gaurav Sharma 2018. Photo: Start of the 175th OPEC Ministers' Meeting in Vienna, Austria on December 6, 2018 © Gaurav Sharma 2018. The Oilholic arrived for visit number 25 to Vienna, Austria, for the 175th Meeting of OPEC Ministers on Wednesday (December 5) with a 'Qatarstrophe' in the background, rumblings over the Saudi-Russian oil market bromance, and of course US President Donald Trump declaring himself to be a ‘Tariff man’ after declaring a temporary truce with China. 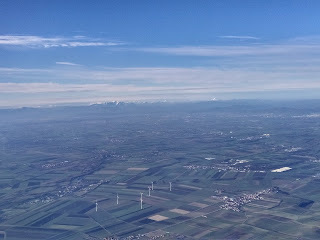 The view in (see above left, click to enlarge) – of wind farms in the foreground and mountains in the background – on a clear Austrian day was quite a sight, and on the ground, yours truly's early morning flight from Heathrow (BA696) pulled up right next to Russian Oil Minister Alexander Novak's plane. Surely that's a 'crude' sign of things to come over the next few days. Right, first to the Qatarstrophe, in case you haven’t heard – Qatar, which has been a member of OPEC since 1961, has decided to quit the cartel to "renew and redouble" its national focus on natural gas. Away from the official version, Doha feels cornered in a cartel that no longer serves its interests and is dominated by Saudi Arabia, a country that has slapped economic and diplomatic sanctions on it. While Qatar's announcement created an intraday kerfuffle and a mini shock, it should hardly come as a surprise. Here is the Oilholic's detailed take on the development for Forbes. 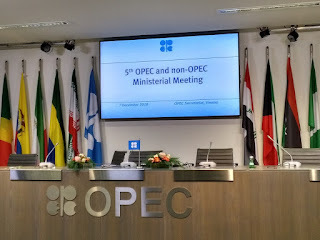 Unlike others, this blogger believes the development is not a fatal blow for OPEC, since members come and go, quit and rejoin. However, it is worth noting that Qatar is the first Middle Eastern member to quit, and Saudi Arabia and United Arab Emirates must shoulder much of the blame. 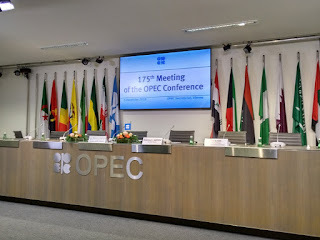 And there are other rumblings – many other OPEC member delegations are briefing in Vienna that they are not particularly impressed by the bonhomie (or more appropriately a crude bromance) between Saudi Arabia's oil minister Khalid Al-Falih and his Russian counterpart Alexander Novak; the two architects of the OPEC/non-OPEC production cut agreement, first inked in 2016. While others are voicing their concerns guardedly, Iran is doing so quite vocally. Finally, there's Tariff Man – a.k.a. US President Donald Trump, who has, well, made some peace with the Chinese, leading to a temporary suspension of trade hostilities. Parking trade wars to the side, he's been firing tweets at OPEC. Bring in the noise! More from Vienna soon, but that's all for the moment folks! Keep reading, keep it 'crude'! © Gaurav Sharma 2018. 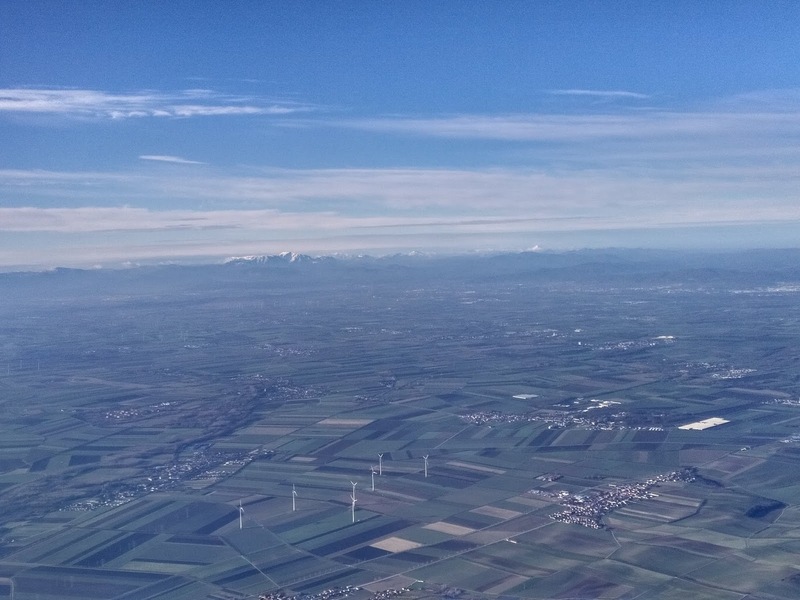 Photo: View of Austrian landscape from BA696 to Vienna on December 5, 2018 © Gaurav Sharma 2018.